Please share this site with your cross training friends! Note : A newly designed chain version with an innovative black chain guard! The new “look” with the black plastic chain cover gives it a “cool industrial” type look. 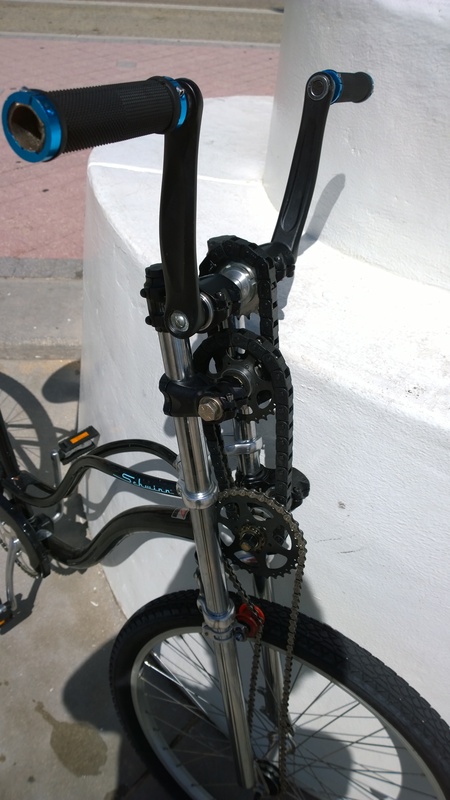 We can attach the front shaft drive to any bike…for now we choose beach cruisers…our choices are limitless! 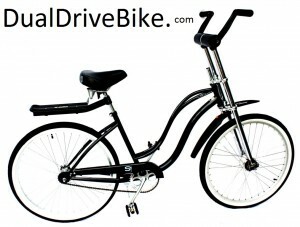 The first ever front shaft drive version of the hand pedaled Dual Drive Fitness Bike! The dual crown front fork set up is easily adapted to fit the head tube any bicycle on the planet. Now that is some sales potential! All the late night fitness equipment infomercials pale in comparison to this mobile exercise bike! So it’s been awhile since my last update. The challenge of building a working Prototype for a chain version and a drive shaft version of the dual drive bike has been fun! I now have a working Prototype of each and I think both are going to be well received in the marketplace. The above and below pictured bikes are of the shaft drive and chain drive versions ridden in the up-coming crowd funding Video. I have some sample gears that are in the process of being manufactured in China and will ship to the USA by the end of August 2014. We will thoroughly test the gears and gear ratios before placing our very first large order. Officially filed a provisional patent (July 2014)on the above “chain version”. 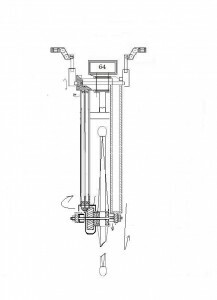 Hopefully we will get a utility patent on both the chain drive and the shaft drive front wheel drive! Still “Patent Pending” on the shaft drive invention after 1 1/2 years. August 20, 2013 Officially Patent pending on a USA Utility Patent! Ever have a 50 page term paper due? Well it’s a huge relief to get that project completed! We were patent pending on a provisional patent. The filing of a utility patent is quite a bit more challenging. I’ve also recently taken a rear hub apart and machined it smaller to receive and attach the sized gear I need to get the correct gear ratio for the front shaft drive. The spacing for the bottom gears was a problem. I think I’ve got the perfect solution and will be testing DUAL DRIVE PROTOTYPE II shortly. That of course means new drawings and re-machining additional parts. This is all part of the invention process. On to the crowd-funding video! The very first front wheel drive prototype is finished and attached to a girls beach cruiser. It was the only bike I could find in a local store with a 1″ headset….they are all 1 1/8. My dual crown front fork that I have been transforming came with a one inch steer tube. I will post some pictures shortly and some video! I am truly excited about how well the gears and housing ended up coming together with the dual crown front fork set up. I am not an engineer by any stretch but I do know that whatever you can imagine can be made in a machine shop….almost anything! If you can imagine it and draw it, it can be built! I will post some gopro video shortly of the first ever, front wheel, shaft driven , hand powered and foot powered fitness beach cruiser. Cruising to the beach just got allot more fun! Now that I have a working prototype of my dual drive invention I intend to get back to work on the “Crowd Funding” video! 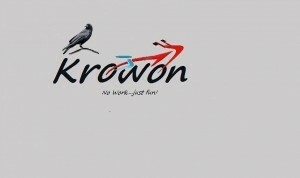 There is much work to be done….but remember, it’s “Krowon” no work just fun! (No work spelled backwards….keeping it fun with passion! 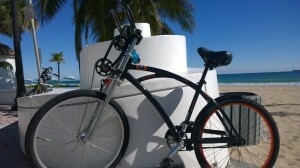 The first ever Bojon Beach Cruiser! True Crossfit Bike …all others are pretenders! The new bikes look really sharp. And we are hearing lots of positive buzz about the ride, the design and the concept. Very exciting product … cannot wait! I will eat many donuts in preparation for the flab I will lose when I get mine! 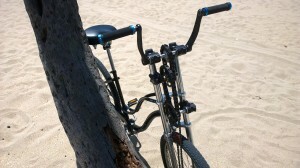 Two years later…I am launching my Kickstarter campaign to hopefully get the Dual Drive Bike to market. It is truly a worthy cause! To be competitive in the bike business you have to go to China for manufacturing, Ninety percent of all bikes in the world are manufactured in China. 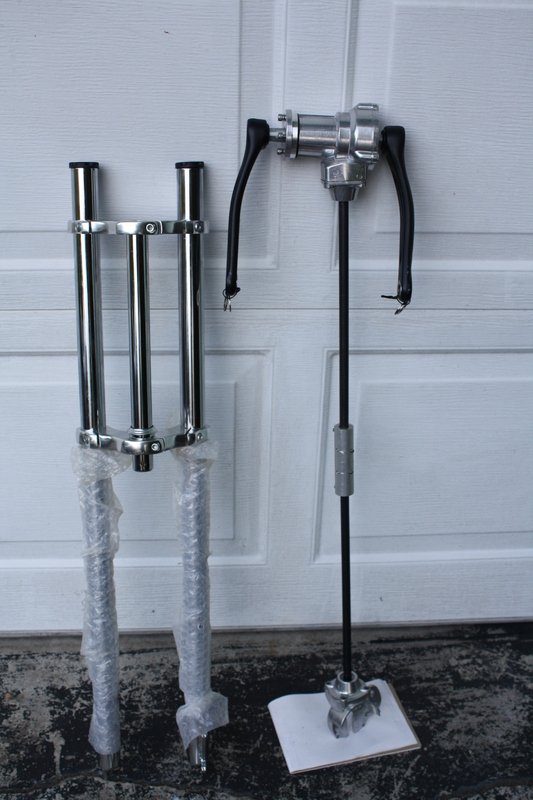 November 2012….So, I am in the early stages of starting my new dual drive bike business. It’s been fun thus far. I am sourcing parts and bikes all over the world, building a web-site with very little knowledge or money to spend and working in my garage on the revolutionary new idea! I purchased a chain-less bicycle from Dynamic a few weeks ago. It has a drive shaft instead of a chain and an 8 speed internal shifting rear hub and I love it. I intend to move that same drive shaft and hub technology to the front wheel. 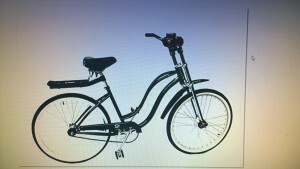 The handle bars will be replaced with ones that rotate. 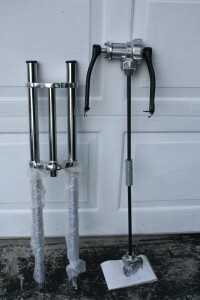 The drive shaft will be run down the the right side front fork and connect to the front hub. 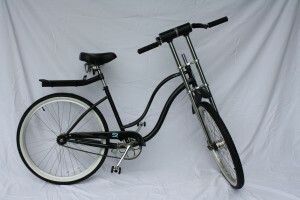 The hand powered front wheel drive will look excellent with no greasy chains in your face! Voila, the first ever, chain-less dual drive bicycle! Cool beans! Two independent drives will power the innovative dual drive bike to faster speeds and a better workout for you. The picture above, shows how I connected a longer drive shaft to the front hub and of course it works! It is simply a matter of getting manufacturing up and running and we will be in business. 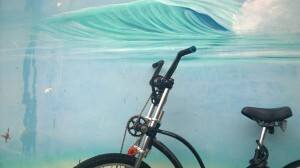 The “Bojon Beach Cruiser” will be styling the dual crown front forks at a beach near you! 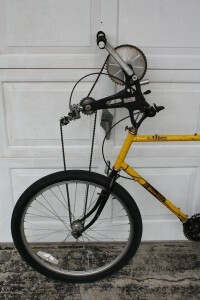 The photo with the yellow frame, is the old school look of my 25 year old front wheel drive fitness bike with sprocket and chains in your face. I really am excited about the new “look”! I filed for my patent in November of 2012 and am officially patent pending on the new chain-less front wheel drive and a totally chain-free dual drive fitness bicycle. Update from the patent office (Nov. 2014), I will be getting a utility patent! 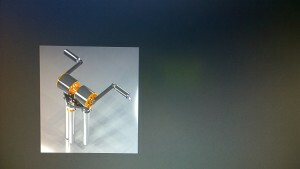 The picture below is my very first working Prototype. 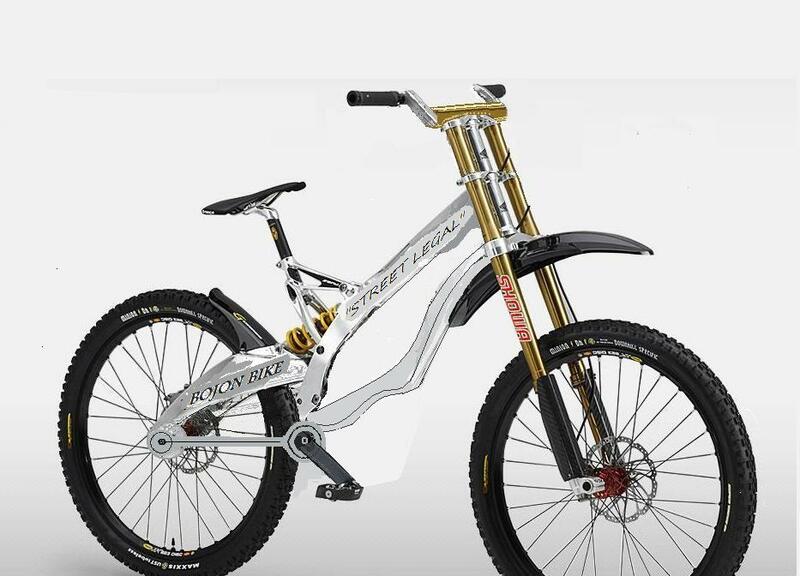 I love the sleek lines of the dual crown front fork set up. 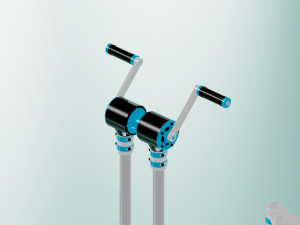 I think using the fork tubes to house the hand powered shaft drive unit and incorporating dual crown front forks into my overall design is a coup. It’s sleek and actually improves the look of the beach cruiser and any other road bike! What do ya think? Sweet look right? I just paid for another domain name. 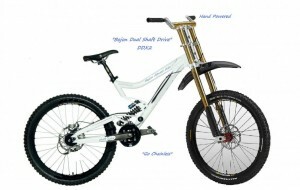 “www.DualDriveBike.com”. I also just got the domain name www.crossfitbikes.com…….perfect! Starting a business from scratch with no scratch means the buck starts and stops with you. Everything from logos, web design, prototype development, patents, photos, videos, industrial manufacturing drawings and overseas sourcing is totally up to me. Failure is not an option! This is the fun part. Keeping it fun is the challenge! With keeping it “just fun” in mind, I think the logo pictured below will look GREAT on your new T-shirt! Building a better Bike! If you are passionate about your new business then it’s not work! “back slang” or mirror writing… NoWork=Krowon…no work just fun! See “Products” page and be the first in your hood to get fit in riding the new Dual Drive Total Fitness Bike! Concept dual shat drive bike! The “chainl-less revolution” is happening now! The drive shaft is in the front fork. Purchase the below Single Speed Beach Cruiser for $1,295… Hand and foot powered dual drive bike. This independent hand powered front wheel drive utilizes 3 chain drives to power the front wheel! The rear drive is a single speed standard chain drive. 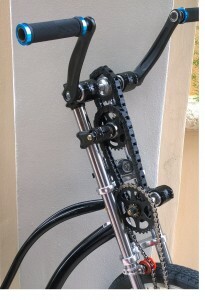 The black plastic up front chain-cover adds an “industrial” look to the dual crown front fork set up. Email: kenhaan@att.net for details. “I plan to employ all the out of work college students and beach volley ball players “between jobs” guys and girls to get sales exploding and get these kids in shape at the same time”! Beach Cruiser…aluminum frame, single speed front and year, dual crown front forks with shaft dive hand powered system up front and coaster brakes for your cruising pleasure!…no other bike like it on the planet! A full body ,total aerobic workout and fun ride! 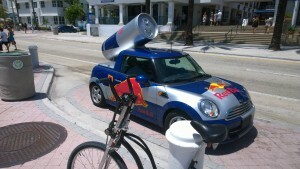 Crowd Funding: a means to get good projects funded and let small companies flourish by using the power of the internet. We think the new fitness bike is a great project and deserves a place on the planet. Update: We gave Kickstarter a shot and it was a bust. The beer cooler, on the other hand that another company ran with on Kickstarter, raised $12M. Nobody got their cooler that I know of ??? It’s obvious that Americans would rather drink than exercise…lol I had better put a beer holder and a blender on the DD bike! By purchasing our bike you will become a total fitness junkie AND you will help promote out bikes by simply getting out there and riding them. The DD bikes are very visual, people cannot help but stop and stare! You might as well recommend it and earn 10% for your troubles! This revolutionary dual drive fitness bicycle truly deserves a place on the planet. Our society seems to need more fun and outdoor fitness activities. Obesity and diabetes in America are increasing at alarming levels and this fitness bike is a product that will stem the rising tide!